Meditation is a life-skill that will open you to the greater possibilities of life. Any aspect of your day-to-day activities will be enhanced by regular meditation – even if it is just for a few minutes each day. Our health is founded upon a relationship between body, mind and spirit and the wellness of each part – the physical body itself is only one component in the overall equation of well-being. This principle of holistics recognises that a stress-free and happy mind and a blossoming spiritual life are major factors in our physical health. Just as stress and negative emotions silently diminish our life force, so too the practice of meditation releases a new and positive life force – born of inspiration, happiness and peace – into every aspect of our existence, creating the optimum conditions for vitality and health. With meditation even our sleep pattern can change – an improvement in quality, a likely reduction in quantity. More time and energy to live our lives! The way we feel and function in our outer life is largely determined by our inner life – our happiness, our confidence, our moods, our consciousness. We often have little power to change events in the outer world, but we can change the way we react to them. When we are happy and calm, difficulties and problems are easily coped with – when we are anxious or unhappy, the same difficulties can become nightmares. Our whole experience of life is coloured by our own consciousness – our life is the creation of our minds! Meditation balances the inner and outer worlds and brings out the bright colours of our nature – joyfulness, serenity, loving kindness, strength. These emerging positive qualities reshape our very experience of life, for everything starts within. Meditation is a practice. Meditation is an every day existence. 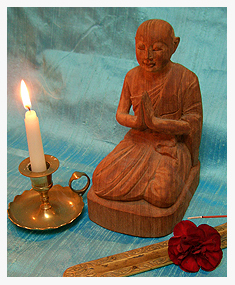 Meditation is bound by minutes – that sacred slot between awaking and working. Meditation enters into and becomes inseparably one with our entire day. Meditation is static, motionless. Meditation is dynamic, active. Meditation is a life transforming experience. Meditation is an ever-blossoming voyage of self-discovery and inner awakening. A student of meditation very soon discovers that meditation is not an isolated activity confined to the corner of a room within an allotted time-frame, but rather an achievement that cannot be separated from every day existence. The fruits of meditation – peace, love and joy permeate everything that we say, do and think. 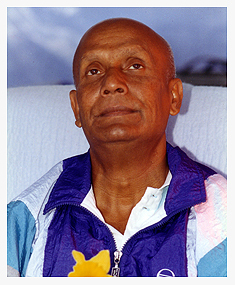 Sri Chinmoy – tranquil meditation. The skills that we develop in order to maintain our regular meditation practice – discipline, willpower and determination we can employ in our other pursuits and aspirations both earthly and heavenly. Creating a calm and still mind is essential if we wish to experience meditation or the ocean of vastness within ourselves. This same calm and still mind is essential in order to live a life of harmony with both those around us and the Self within us. Meditation is more than a relaxation technique. Like a perfectly centered spinning top that spins so fast that it appears motionless – meditation is stillness in action. Meditation is pure crystallised energy. Meditation is an open door to happiness. Meditation is simplicity. Meditation is enlightenment. Concentration gives the message of alertness. Meditation gives the message of vastness. Contemplation gives the message of inseparable oneness." Meditation is like going to the bottom of the sea, where everything is calm and tranquil. On the surface there may be a multitude of waves, but the sea is not affected below. In its deepest depths, the sea is all silence. When we start meditating, first we try to reach our own the inner existence, our true existence-that is to say, the on bottom of the sea. Then, when the waves come from the outside world, we are not affected. Fear, doubt, worry and all the earthly turmoil will just wash away, because inside us is solid peace. Thoughts cannot trouble us, because our mind is all peace, all silence, oneness. Like fish in the sea, they jump and swim but leave no mark. So when we are in our highest meditation we feel that we are the sea, and the animals in the sea cannot affect us. We feel that we are the sky, and all the birds flying past cannot affect us. Our mind is the sky and our heart is the infinite sea. This is meditation.